I'm in Florida, dealing with family matters. Here is a post from a few years ago, in which I'm doing the things I would ordinarily be doing this time of year. 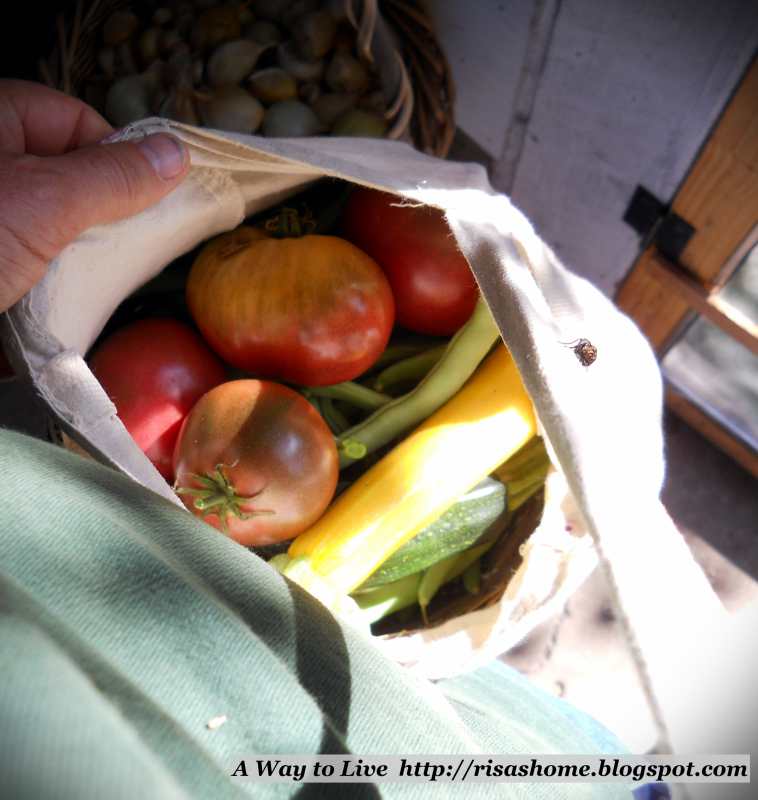 Harvest something: Tomatoes, peppers, onions, green beans, cucumbers, zukes, butternuts, delicatas, pumpkins, eggplant, corn, rhubarb, blackberries, grapes, filberts, eggs, potatoes, kale, bok choi, beet greens, chard. The green beans and runner beans rested and then made another full crop! I have heard of this but never seen it happen. Preserve something: dehydrated tomatoes and apples, canned tomato soup and lumpy applesauce, started a batch of apple vinegar, shelled and froze filberts, strung leather britches. Refrigerator pickles. Laid out squash and onions to cure. Waste Not: Firewooded, began taking down awnings and closing windows. Had a big storm to break the drought; rested the well pump. 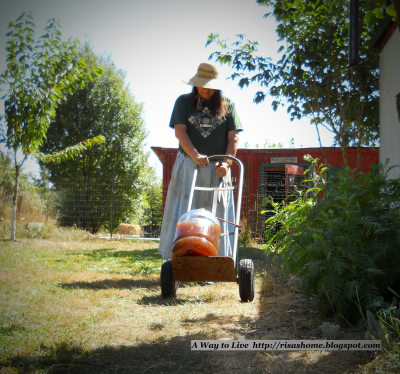 A five gallon carboy of cider needs about eight buckets of apples, seems like. Since they're going to be crushed, I don't have to be careful about bruises. Except maybe my own -- I did fall into the dry wash yesterday, which was lined with blackberry vines and stones. Never a dull moment. I admit this little electric shredder is my crusher. In general, I would not advise imitating me on this or any other aspect of my apple doings. In my defense I can say a) it's dedicated to this, is not used for tree branches, leaves, poison oak, etc., b) I'm not making this stuff to sell, so it's not like there's going to be a health inspection and c) yes, everything's been washed. 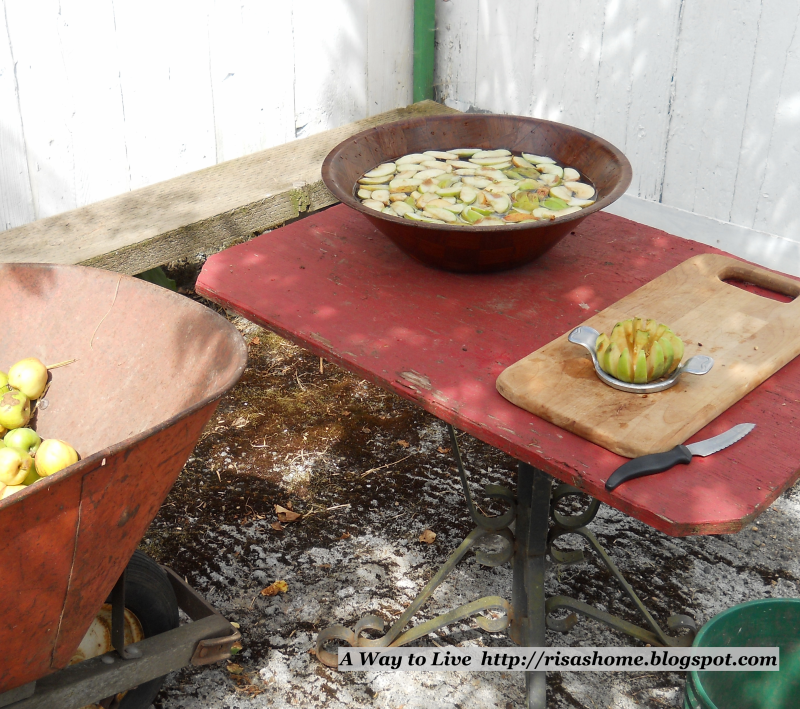 I chop the apples in half and throw them in the hopper. Pour in some blackberries, too, for revenge. When the receiving bucket is full, I transfer the contents to the squeezing bucket, which goes into the press. 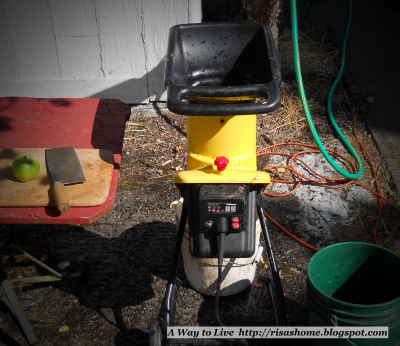 This (ahem) press consists of four blocks of six-by-eight strapped together with angle irons, a wheel, an automotive jack, a trimmed-down bucket lid, an inverted one gallon bucket between the jack and the bucket lid which is inside the six-gallon squeezing bucket. There are about thirty holes drilled in the squeezing bucket, all down one side. Maybe 3/8" diameter. Most of the juice that is separated from the pulp will go up past the lid, not down, and will pour out the top three or four holes or so. So, a haphazard press, but it squeezes, and didn't cost six to eight hundred bucks. All this drains into a plastic tub placed strategically near the table. The cider will be dipped and strained into the carboy through a funnel. There is a lot of adjusting and fooling around going on here, I'm sweaty, and there are a LOT of yellow jackets to avoid putting my hand on. I pour myself a glass of fresh AJ and sit in the shade awhile. Off to the potting shed with about 4.75 gal. of cider. I've added a bit of wine yeast and will cap the carboy with an airlock. If it makes cider, nice. If I've goofed and made vinegar, that's nice too. Lots of uses for the stuff. There are four carboys on hand and some gallon jugs. 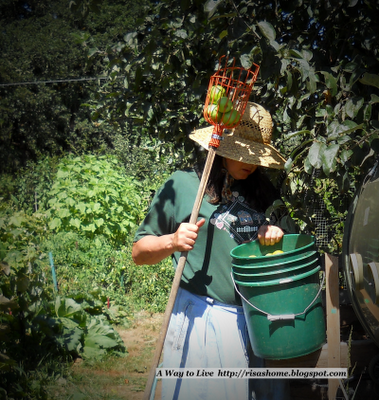 It takes much of a day to do this alone on this scale, mostly because of the clean-up, so I plan on once a week during the picking season. We'll see what apple, apple/blackberry, apple/grape, apple/blackberry grape, blackberry/grape, grape, and blackberry concoctions we can come up with. Not all of this will be wines, mind you. Sometimes I just can up a batch of juice in mason jars in the canner. It's a mood thing. Apple season is upon us; though those in the trees are not quite sweet, there is a serious apple drop in progress. I'm adapting to this by gathering the drops (no way the poultry can keep up with them) before they bruise over, and processing for dehydration. Each apple is smacked with the corer-slicer ring and the core is discarded, then the fourteen slices briefly examined for quality. Those not accepted fall into the reject bucket with the cores, the rest are dipped in vinegar pr vitamin C water and salt solution, then transferred to the dehydrators. 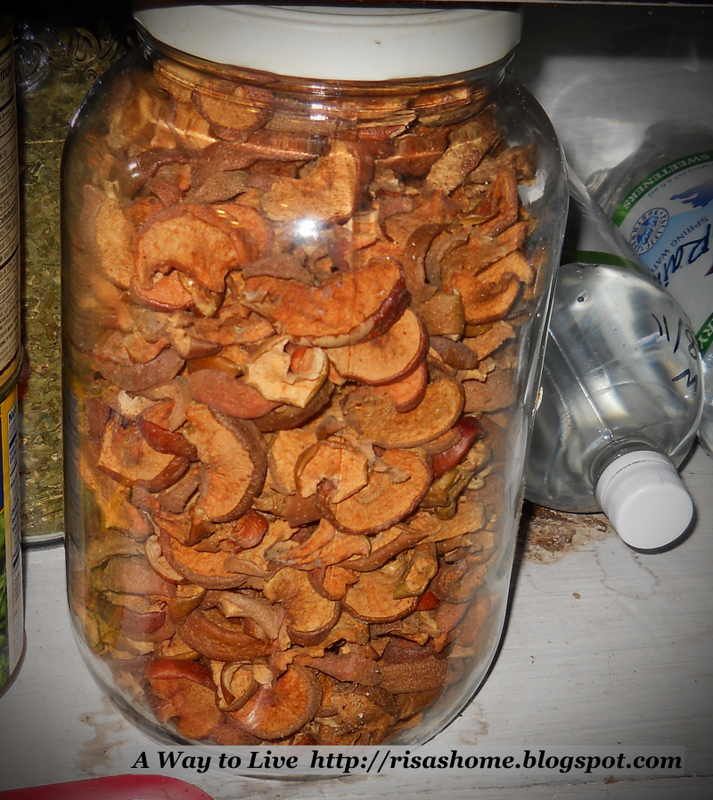 Dehydrated apples keep a good while and represent useful nutrients and carbs. Home dehydrated slices are not as appealing as the sulfured product from the grocery store, but reconstitute well and can be added to hot cereal, breads, soups and other dishes or made into pies.The reject bucket also represents a resource; its contents can be crushed and pressed to make juice, cider or vinegar, and the "squeezings" given to the chickens or used as compost. While thinking about all this, be sure to wash all your equipment before calling it a day, and pick a peck of particularly pretty "pommes" for the kitchen fruit basket, and/or to share as the evening turns to night. [Munching fresh apple] "What star is that?" Nineteen years ago today, our family occupied this site. I'm not absolutely certain what "ownership" means; my own tribe has behaved badly, in my own opinion, and I can only plead that that was before my time. And so here we are. I can quibble that our whole species is invasive on this continent, for what that's worth. I do know we Bears gave up what was, to us, a lot of money for fifteen years in order to be able to say the place is "ours," and I know that we have to give a certain sum to the local jurisdiction -- something called a "county" -- every year, or we could be put off the place. One of the things that was here before we got here -- was here nineteen years ago, all along the southern stretch of the seasonal creek running diagonally through the place -- among many other invasive, non-native species -- is knotweed. Our county purely hates knotweed, perhaps mostly because it can't really be kept in check and so can ruin a landscape planner's day. It seeds readily into the water and sprouts somewhere downstream; perhaps that's how it got to this spot. Once established, it spreads underground, storing food in enormous rhizomes that will resprout if the foliage is cut down. It will resprout through a brick floor with ease, by the way. We're told the county can tell us to get rid of it -- well and good; shall we dig it up? We're in our sixties. Pigs will eat it and no doubt upend the roots, too, but they are problematical along the creek bank. Shall we spray it with herbicides? We're organic. The county can choose to declare eminent domain and spray it and bill us, I suppose. But in our two decades here we've yet to hear from them. For entirely unrelated reasons we actually kind of appreciate that. It's, so far as we know, here to stay. How do we make a good neighbor of it? It's said, in young-shoots form, to be edible. In China and Japan there are those who are well versed in foraging for it and preparing it for dinner. All I can say to that really, is that some folks seem to me not very choosy. Sheep and goats eat it. Seen 'em do it, right here. That's a plus. Hens, I'm told. No way our birds are gonna keep up with it, though they may nibble from time to time. Well, the stuff is tall -- eight to ten feet. it's flimsy, but not too bad, at least for the first year. Bean poles? So mushy when green, you can manage it with a bread knife. Yes, some of the bigger stems do in fact make acceptable non-weight-bearing polewood. They are bendy but if tied in bundles they will straighten over the winter. The stripped leaves can be composted. The trick with this is get it done before the flowering bits go to seed. beanpoles upside down. Apparently not necessary. There are lots of stems too small or bent or bashed to take part in the beanpole project. What to do with these? 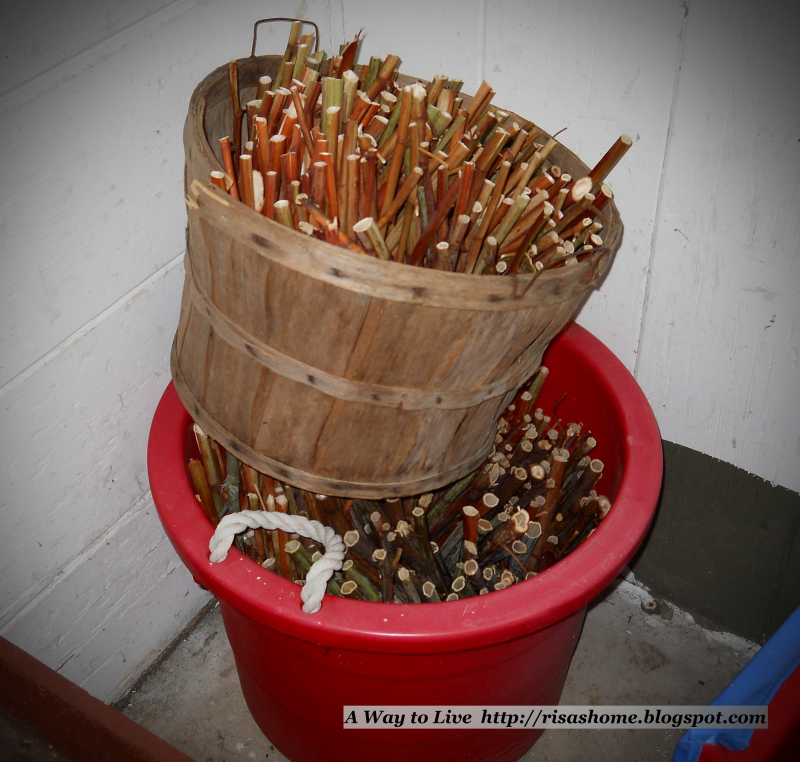 Snip off each stick at the desired length by measuring against the container. Quite by accident, we found that "sticks" cut from knotweed and dried a deep brown or red make good fire starter or kindling. Not so well as cardboard with cedar, but not bad, though with their bamboo-like structure they sure pop a lot. About half the winter's supply. Green sticks will turn brown before then. So every year before the flowering stage we slash the entire patch down, thus saving folks downstream some trouble, and dry it and process it into three piles: beanpoles, kindling and compost. Sometimes the dried leaves and bits are thrown over the southeast "hillside pasture" and mowed. Sometimes they are run through a shredder and spread on the gardens. It's nice when everybody -- and every thing -- pitches in. Take a small cloth shopping bag, cut each handle at one end, sew the loose ends together with some dental floss, go picking. Risa has a basket in the bottom of the bag, also not shown, gloves and a garden knife. We have looked at twenty-to-forty-dollar garden knives in the catalogs but there's no need for them. We pick up dull stainless-steel butcher knives for a buck apiece from St. Vinnies, shorten and sharpen them on the bench grinder, paint the grips red for findability, and leave them in the garden "mailbox" to be picked up when needed as we pass by. They are a little brittle for digging up dandelion roots, but we figure that's what our "Korean plows" are for. We splurged on those but you can make them from steel-necked trowels, just put in the bench vise and bend to a ninety degree angle. The tomatoes are Cherokee Black heirloom, they came in earlier than even the Sungolds and have good flavor. 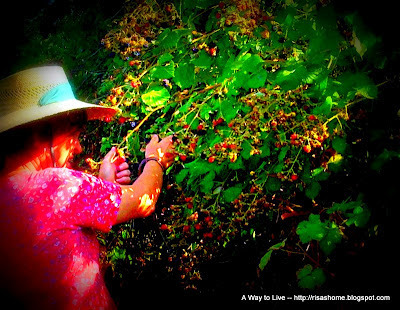 It is blackberry season hereabouts, not all at once, but in mysterious patches -- lots ripe in one spot, all green twenty feet away. Last Son has been here and put in a shift to clear away the dreaded knotweed all along the creek (we will use it for beanpoles and kindling), so the sun (and our fingers) can get to the berries. Early in the season we like to pick directly into up-cycled 32 oz. yogurt tubs, but these can be awkward to carry. Risa has made a couple of picker's bags using small linen shopping bags with the handles cut from the bag at two ends, then sewn together with a bit of dental floss to make a shoulder strap. The tub of the day rests snugly therein, along with a pair of gloves and pruning shears. As soon as there is only two inches of headroom, she'll pop the tub into the freezer. This much room is prudent because the water in the berries will expand eleven per cent when frozen. There are already eight tubs full. 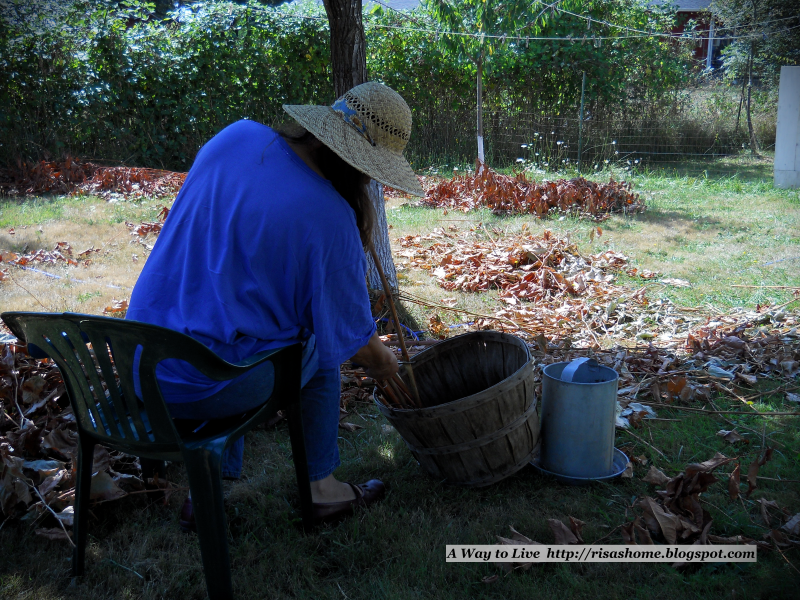 It might be necessary to start canning or even wine making. Risa might have to head for Florida at any time, given her dad's health (she's an only), so she may not do any wine making this year. A call in the middle of complex activity could leave Beloved with quite a mess on her hands. Apples are falling from the Transparent tree at a pretty good rate, but a taste test says these are not yet ready to crush, ditto all the other trees, the crops of which tend to mature in September or even October, along with the grapes. One strategy is to juice blackberries and can them, so as to add them to any mixed-fruit canning or wine-making later. One can only use up so many jars of blackberry jam, and we have lots from last year or even the year before. Our favorite use for the berries, though, is as is, frozen. The 32 ounce batches are moved from the freezer to refrigeration one every two weeks or so, and parceled out for use with yogurt or in oatmeal or the like. Risa also uses them in breads, pancakes, and waffles. Bring on the winter! We know how to eat. Risa picks the last peas and drops them in a chilled bowl of vinegar water. Then she unties the beanpoles and tee posts and stacks them for next year. from the coppice or from the knotweed patch. The pea vines are separated from the kale and such that had been growing beneath them. them, they're retrieved and used as mulch around the place. eats the freshly "pickled" peas. Blimps -- we won't use these at the dinner table. We can soften them on the stove a bit, slice them up and feed to the poultry. Or slice thin to dehydrate for soups, stews, egg dishes, and breads. The pulp and half-formed seeds add a surprising amount of protein. It's a winter staple, says Carol Deppe. this about half vinegar, half water here. Yes, this is a solar dryer. 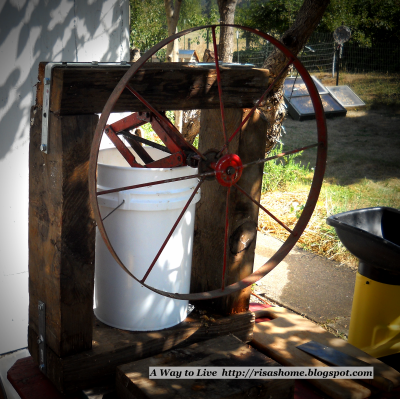 It's composed of found materials and it works. 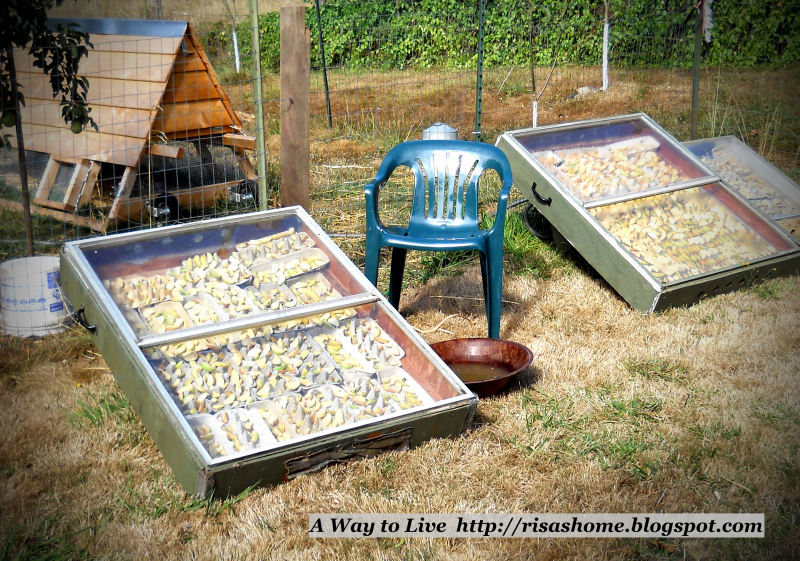 Simply build your box to the size of your window and ventilate at each end. Egg cartons will do for your trays if nothing better is at hand. ... tip your dryer toward the sun and let stand for a few days. In hot, dry weather two days may be enough. The vinegar can be used afterward to clean glass. Any left over can provide a nice tang to salad or stir fry ingredients. Iron Buddhas is a lightly fictionalized memoir of a woman's experiences tree planting and fire fighting in the Pacific Northwest in the 1970s. Stephanie Smith sets out from Georgia to Oregon in the winter of '75 seeking a new start in life. She finds that and more.